So you're about to hit Publish on your new blog post and you're starting to brainstorm ways to promote the post on your social media channels. The last blog post you published got underwhelming traffic. You spent a ton of time writing out that epic post, only to hear crickets when logging into your Google Analytics dashboard. What can you do differently this time that help give your blog post stronger legs? You're already there - on Twitter and Facebook. Maybe on Instagram and Pinterest too. These tools are exactly what you need to help your blog post get the traction it needs. You CAN make the blog posts on your organization's website stretch further, reaching bigger audiences and driving higher volumes of traffic. You simply need to better utilize your social networks. Let me walk you through the system I use to create 15 or more social media updates out of one new blog post. I'm also going to share the spreadsheet tracker we use to keep those updates organized so we're not looking all spammy and lazy to our audience. Get your hands on our Social Media Tracker to organize all your blog promotions in one easy spreadsheet! We're going to start with a sample blog post. For the sake of this demonstration, I'm going to title it "4 Easy Ways to Elevate Your Online Brand". In our hypothetical situation, this example blog post was written by a brand and graphics expert that serves businesses trying to update or create their online space. Every blog, brand, and marketer should know that the place you must start is with defining your target audience. I want you to consider that each individual blog post you produce also has a specific target audience, which is likely a small subset audience of your org's larger target. For instance, the company I referenced in our example may serve both online and offline business clients, but the blog post they're writing may be targeted specifically to online business owners, creatives, and freelancers. Freelance to Freedom - Leah Kalamakis' FTF community is a collaborative serving online freelancers who are looking to use their freelance biz to create more flexibility in their lives - through increased income, time, or passion. You can find them on Twitter at @theftfp or click here to join the Freelance to Freedom Project Facebook group. Freedom Hacker's Mastermind #freedomhacking - Kimra Luna leads this huge, amazing group of generous biz leaders, sharing her extensive knowledge of webinars and online business building tactics. Check out Kimra's space on Facebook here or tweet to her on Twitter at @kimraluna. For Love + Money with Caitlin Bacher - Caitlin's community is chock full of creatives and makers, eager to learn from her about increasing their sales through social media. She is killing it in the social space (we pick up tips from her from time to time too) and has a no-nonsense way of coaching that is super refreshing. Join Caitlin's community on Facebook through here and follow the chatter on Instagram using #mycreativebiz. Go check out the communities containing your audience members, read some of the questions community members have, answer some questions that align with your expertise. Get to know your audience in a more personal way by interacting with them directly (yes, get right in there and start a conversation with someone!) and you'll start to see ways in which your latest blog post can benefit them. Hopefully. If you don't, you may want to edit that post to better target your audience and answer their questions! If you're already doing the things outlined in this step - great! Keep on it. It'll save you time down the road to keep your connections in these communities strong. "Leading lines are the lines that lay within your image and serve to direct the viewer to areas of interest within the photograph, as well as to create depth and dimension." In copywriting, I use leading lines in a similar way to how they are used in photography - to direct the reader to areas of interest within my piece. My leading lines might be subtle (or not so subtle) hints about what readers will learn in your post, a question that is commonly asked about your post subject, or a summarized version of the contents and a hint to your freebie. Basically, your leading lines can be used as alternate (but less SE-Optimized) versions of your blog post title. 4 simple online branding tips + a freebie download! I love using leading lines on social media because it provides plenty of opportunity for link-backs to be created for your blog post, without looking like you used a cookie-cutter to write all your headlines. You can spend some time developing your SEO keywords for these leading lines, but also just have fun with it! You're still reaping the juicy SEO goodness with each new link-back to your site. Here comes my favourite part! In this step we take all the leading lines you created for your blog post and mash'em all together with the communities where your audience is hanging out. We're going to create 2 posts each for your Facebook Fan Page, Pinterest, and Instagram accounts, then an additional 6 tweets. We're also going to talk about a strategy to utilize those awesome Facebook groups you've joined from Step 1. Great article with 4 simple online branding tips + a freebie download! Note: Pins that include a badge or mention of a freebie perform better than those that don't, so flaunt your content upgrades, folks! Note: Don't forget that Instagram only allows clickable links in your profile bio. You should always direct your audience to that link with a Call to Action. Note: Keep it short and sweet with Twitter! Keep it to under 80 characters to leave room for your URL link and to encourage your followers to RT with a comment. See how that works? It's really just about copying your blog title and leading lines for each update, with some teeny tiny tweaks as you adapt to each social network's culture. If you're on any other networks (like LinkedIn or Snapchat) you can use this same process to create updates for them too. Narrow down three active Facebook communities that you enjoy and where members of your target audience hang out. This list might include a Facebook group that you own/moderate, or may consist completely of groups owned by others. I want you to set a goal to post a link to your blog post at least once in each of the three groups you've identified. But be careful! Pay close attention to the group rules. Some groups only allow 'promotional posts' (your blog URL) on specific/themed days of the week; other groups don't allow promotional posts at all. Obey the group rules to ensure you can continue participating in the community. One of my favourite tricks is to use the search bar to find questions that other members are asking about your blog post topic. Leave a comment on their thread with some helpful info and a link to your blog post (if allowed) or say "I wrote a blog post about this recently, I'll PM you the link!" Not only does this allow you to engage community members one-on-one, but it can also set you up as an expert in your topic area. All the hard work is done! 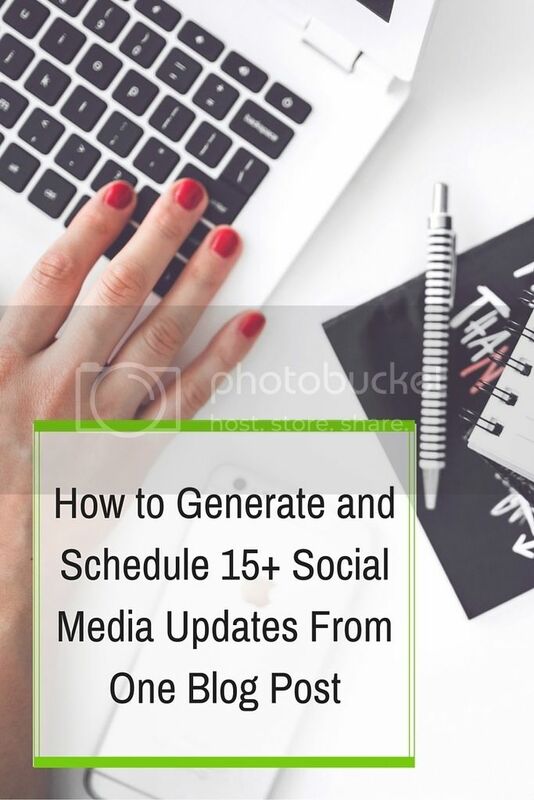 In this final step you're just going to add your newly-written social media updates to the scheduler of choice (around these parts we love Buffer and Hootsuite) and voilà! The average Facebook posts live for about 5 hours, according to PostPlanner, so we suggest sharing your blog post link once per day - maybe two days in a row or with a day in between. Don't forget to add other kinds of posts as well, to give each update a little breathing room. In contrast, Moz says your tweets capture attention for only about 18 minutes, so that's why we create 6 or more tweets for each new blog post. We space them to go out a couple times in a day or once a day for a week or so. The lifespan of Instagram posts also tend to be shorter, so feel free to schedule repeated updates (as long as you aren't repeating your image) with strong Calls to Action. Jeff Bullas has stated that an average Pinterest pin can come up in search for months after it was posted. It's super important to make sure your graphics are appealing and draw attention to your freebie to take advantage of the long lifespan. Pin once to your own board and another to a group board for maximum exposure. With 12 broadcast-style social media updates and 3 additional, strategic blog post promotions, you now have at least 15 updates to keep track of. If you're like me, that's too much. I get a bit scatter-brained and forget how many times I've tweeted X link or pinned Y link. So I write it all down in my handy-dandy blog post promotion tracker! The tracker lets me know how much 'push' I've given to each of my blog posts and helps me identify which networks could use a little more love. Grab a free copy of our tracker for yourself through the link below! Well, we hope you found that helpful :) We can't wait to see how you use the tracker to ROCK your social media strategy! Newer PostShould Your Nonprofit Start Livestreaming?